One soldier that has a place of honor in the Arlington National Cemetery is General John Pershing, who played an instrumental part in the First World War. For many, this man signifies the average American who went to war in days gone by and his gravesite is one of the top military themed attractions in the city. General Pershing was born John Joseph Pershing in Missouri in 1860. His family were descended from German immigrants and they had anglicised their names when they came to America. He first worked as a teacher but later joined the army because of the improved prospects that they offered. He thrived in the army and quickly made his way through the ranks available to cadets. Through the decades that followed, Pershing was part of many of the most influential conflicts in American history. From the settling of the west to the Spanish and Philippines wars, he gained decoration and experience through his military career. Pershing became General thanks to the petitioning of President Roosevelt, who was personally impressed by the man. This wasn’t a simple process however, as at the time titles were awarded to soldiers based on time served. The seniority of other officers stood in the way of Pershing’s promotion but in 1905 he was recognized for his service. Roosevelt petitioned Congress to allow Pershing to become a Brigadier General, which entailed him making his way through three ranks. The decoration came after a long stretch in the Russo-Japanese war for Pershing, who was 45 at the time. He preceded in front of 835 more senior officers to take the role, though most recognized the strategical prowess that made him fitting for the promotion. When the US became involved in WWI, General Pershing moved from his station in Mexico to DC to direct troops. He was interviewed by President Woodrow Wilson and was responsible for the control of two million soldiers by the end of the war. General Pershing travelled to Europe to personally command troops, as he believed that only American Generals should issue orders to American troops. At this time he was 58 and had a wealth of battle experience behind him that proved essential in gaining ground. His persistence and tactics allowed the army to gain ground against German soldiers and weaken their defence. After the war, General Pershing was largely recognized as one of the key influencers in winning the war. In his later years, General Pershing worked within non-profit organizations to provide opportunities for young Americans. The General passed away in 1948 of natural causes and was buried in a place of honor in Arlington National Cemetery. 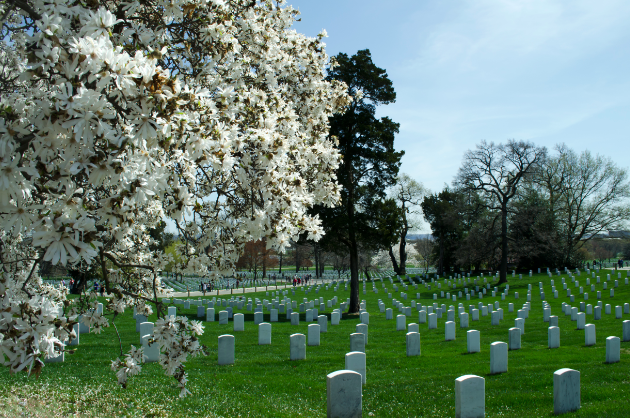 His gravesite can be seen on our tours and this site is an excellent place to pay respects to one of the military leaders with the most varied services. The numerous decorations that he earned in his career are a reminder of the conflicts that he served in and his colorful history. If you’d like to learn more, then visit this sight with us.